Yesterday was Sunday so it was another hiking day for Carol and I. We have been at this for a few years now and continue to discover new spots to hike. Yesterday we discovered a nice little three mile hike just 10 minutes from our house. 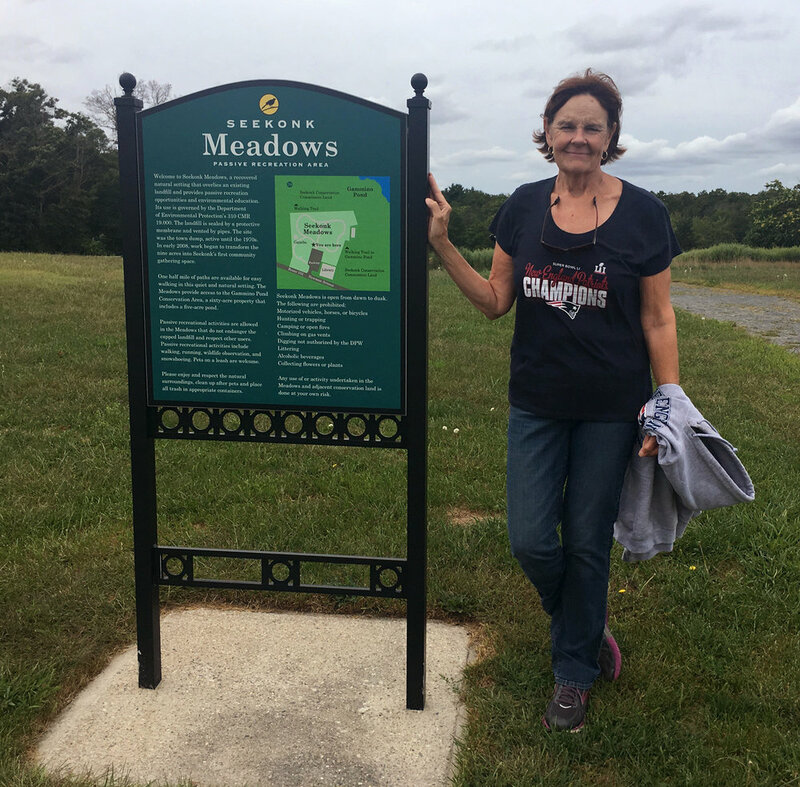 Seekonk Meadows, just behind the Seekonk Library is called a 'passive recreation area' whatever the heck that means. What we found was well groomed trails and a great Sunday hike. Our Sunday started as most Sundays do with breakfast at a diner. We also discovered a new diner just minutes from the house as well, really just three minutes from the house and we had never been there... go figure. Called the East Side Diner, it sits right at the intersection of Waterman and Pawtucket Avenues and is less than one mile from the house. Good food, great service and very good prices, it gets my full recommendation, we will return. From the diner it was less than ten minutes to the parking lot at the library and off to the trails we went. The trail was well marked with nice new plastic blue diamonds, but even without the blazes it would be very easy to follow as it is wide and well maintained. 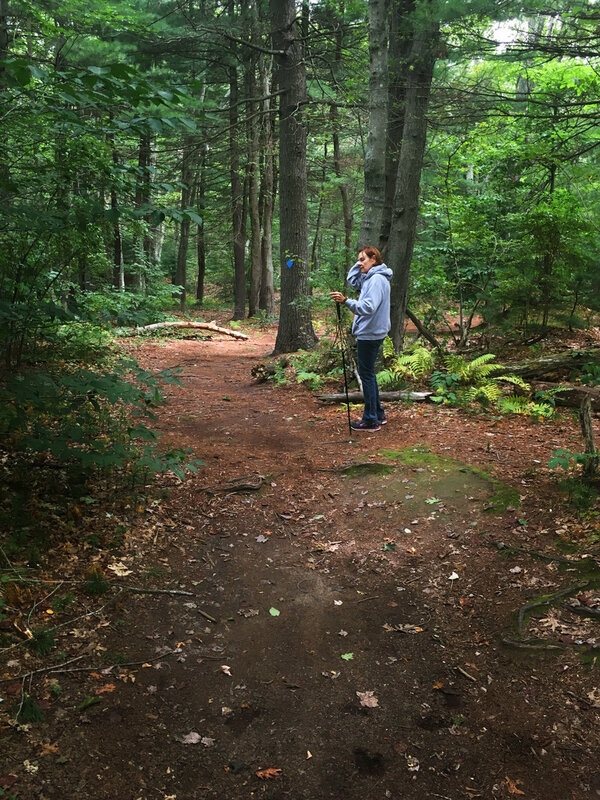 We were quite surprised to find such a 'wilderness' area in such an urban setting. Within minutes of leaving the parking lot we were deep into the woods and it felt as though we could be off somewhere in an exotic forest in a destination vacation spot..but we were just here, ten minutes from home. There was a very pretty flowering bush along side of the path. I am thinking that it is a Wild Black Cherry after searching the internet for a while but can't be sure. It was very pretty what ever it was. We thought this was pretty funny. Along the trail we continued to be surprised by what we saw and found along the way..including a dead mouse lying in the path with no evident injuries..maybe he drank the water? And ant mounds. 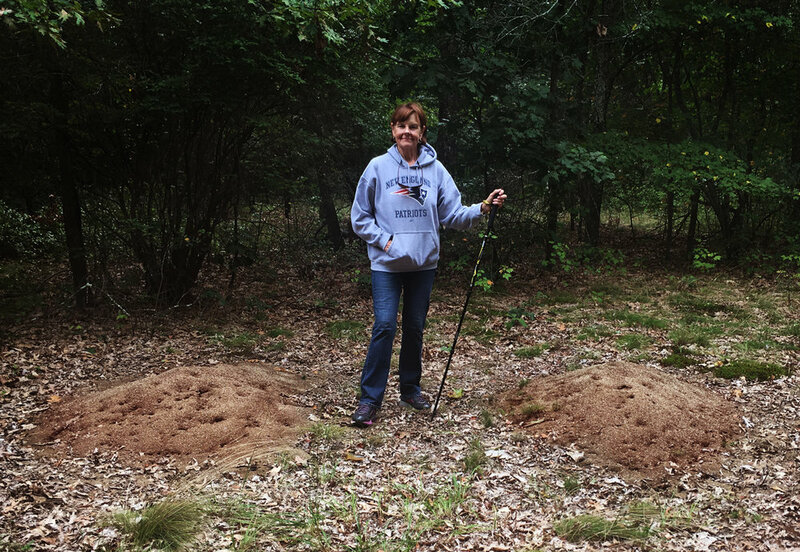 we had never seen ant mounds like these before and they were everywhere near the far end of the trail..we must have seen 30 or more and they each measured about three feet in diameter and must have been 8 to 12 inches high. What a concentration of ants. We even stumbled upon a couple of old race cars dumped in the woods, so I guess we aren't really that far from 'civilization'. It was a great morning hike, and not too far afield so we could make it home in time to watch our favorite local football team, the Patriots. Their stadium is just up the road about 20 minutes or so, but we like watching from the comfort of our couch. Also this past weekend it was our granddaughter Grace's birthday party at the local cart track/arcade. Grace had invited several of her school buddies and we all had a great time. The kids all played games and rode on the go carts. What fun it must be to be 10 years old and have all your friends show up and race each other in go cars, bumper cars and bumper boats., and have pizza and ice cream. 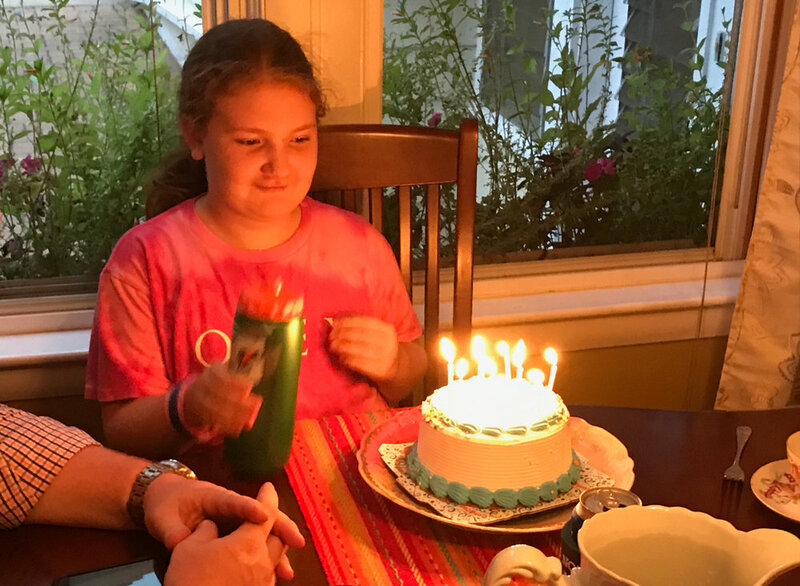 Grace's actual birthday was last Thursday and we had cake and ice cream then too. 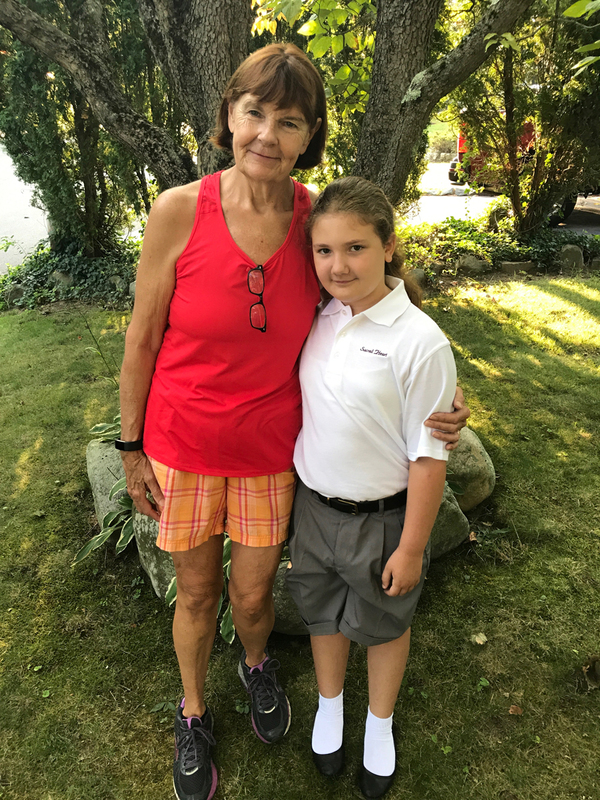 Another recent landmark was the first day of school. 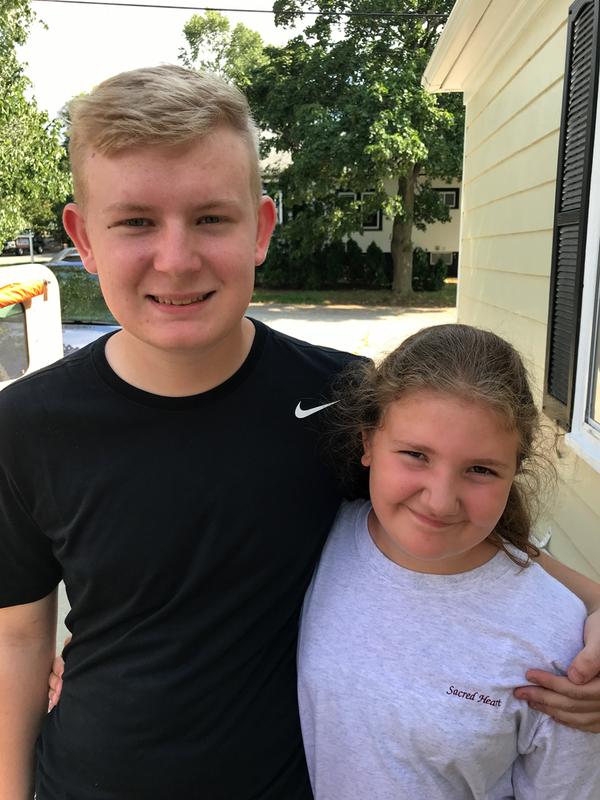 Grace is now in fifth grade and Ben is a senior in high school. I cannot believe how time has passed. Below is a gallery of a few more images.